Woodchuck Tree Service is actually a popular business owned by a family and it has served greater Rockford area for greater than 3 decades. It was originally founded as a hobby, but it soon turned into a full-blown service company. We have insured experts who always take pride in their work. They also treat every lawn, tree and jobsite like it is their own yard. You are the house owner and the landlord so you spend lots of time and money to ensure that your home is taken care of. When you invest with Woodchuck Tree Service, we pledge to you that by maintaining your trees and lawn, your home and property will look more appealing and increase in general value. We have insured professionals who are educated and trained to properly eliminate your tree and we can handle commercial sites and homes. Nonetheless, there are instances when we will not be able to save the tree through trimming, pruning, cabling or topping so only tree removal can be the most suitable choice. Here are some reasons to take into consideration Tree Service. 1. The tree has grown in a hazardous place. 2. The tree is already dead or infected. 3. The tree and the root were damaged. 4. The tree is close to your home or a structure so the roots might damage the structures. You should realize that removing a tree is very dangerous and it is going to require professionals to get the work done safely. We are using different equipment to help get rid of the trees, branches, limbs and stumps and you will not only need a chain saw and ladder. We might be using a claw truck, climbing gear, claw trailer, wood chipper, skid-steer and others to make certain that the job could be done securely and efficiently. If the buyers don’t want to have the wood and branches through the process of removal, we can eliminate the wood and use our wood chipper to cut the branches to smaller chips. There are several jobs that may involve super huge trees or trees that are actually positioned in a tight spot and the usage of crane will be necessary. Crane usage will be a good method to remove the tree in case there are structures below it. We can help accommodate this type of job and guarantee that the hardest to remove trees can be removed. The tree could be removed by multiple sections and every section of the tree can be tied to the crane. The operator will then lift the section of the tree and set it aside. Using a crane will not damage your yard and anything below the tree because it will not be slammed to the ground. The crane will be setting each section of the tree down. Bad weather will undoubtedly bring many difficulties to you, especially in case you have a lot of trees in the yard. The high rate of wind, the soil being too saturated, ice or snow weighing down the limbs through the winter can undoubtedly break them. When the trees or branches fall to your house, we have the professionals which could manage this right away and lessen the ruin in your property. 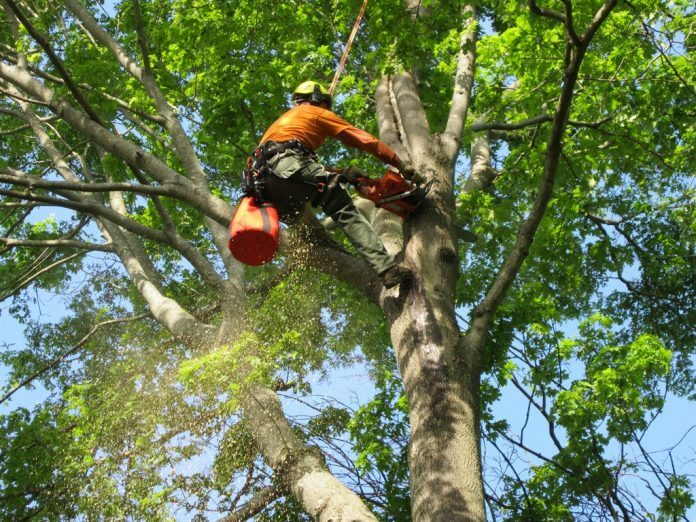 We are here for you in case of emergency and we partnered with restoration and insurance firms to handle the problem so you have to consider Emergency Tree Service in Hillcrest IL straight away. We have 3 different stump grinding machines to acquire your stump(s) taken out the proper way and without any ruin to your property. A stump grinder is a machine with sharp teeth like blades, also referred to as carbide tips. The blades then grind out the stump and roots and makes little wood chips. The stump can be grounded up to 4 to 6 inches below the surface. The stump should be removed to a specific depth for correct growth if soil is laid and new grass or sod is planted. If a customer actually wants to plant a new tree on the removed stump, they should grind it a minimum of 24 inches deep. We currently have a portable stump grinder that are designed for smaller stumps and it is enough to fit through a 36 inch gate. We have track stump grinder for larger stumps. This machine might be used to take out stumps. Our most used grinder is a tow behind stump grinder, used for any average size stumps that are in common spots. The winter season in Illinois is long and cold so we provide 24 hour Snow Removal services in Ridott IL. We have experts that may clear the snow for you in your home or at your company area. The services that we provide could include residential and commercial snow plowing, shoveling, snow blowing, residential and commercial salt spreading and snow removal if the area has multiple snow falls and there is nowhere to place the snow after plowing. The area can accumulate snow rather quickly and it could be very heavy and wet and once these conditions happen, it is going to be hazardous to do the hard work on your own. We also have snow plow trucks that might clear the driveway, parking lot and walk way during winter months. Slippery lots will be dangerous to you and your business so we can offer automatic enrollment for our snow plow accounts. It will imply that we will be at your door depending on the amount of snowfall. We will offer on demand snow removal so whenever you need it, our experts can be there to assist. Snow removal is needed when the snow is 2 inches above ground. Woodchuck Tree service can provide all these services that you need. The only issue is that the area gets ice storm, but we have salt spreaders attached to our trucks for your driveway and parking lots. Woodchuck Tree Service understands that snow and ice conditions can be difficult and we are here to help. Woodchuck Tree Service is using commercial lawn care equipment. We can add you on a mowing-schedule weekly so you won’t need to worry if your yard is hard to maintain. Scheduling starts in the spring and normally ends when the grass becomes dormant. When mowing, we always make certain that the blades are sharp and the height of the blades are set to the right height. Sometimes if the blades are set to low and the grass is cut to short, it can turn brown and die. Our goal is for you to have the most green and soft grass. After a Woodchuck professional mows your lawn, they’re going to weed whack around your home, landscape, and ensure that your grass is equal height throughout your lawn. For an additional charge, we can invariably edge near your driveway, sidewalk or around the landscape to make clean, crisp edges. Because we are large on tree care, our experts will guarantee that your trees are always at optimal health during each mowing service. We will look for any damaged, dead, or dangling limbs. Once a Woodchuck professional notices hazards during their time at your house, you will be quickly notified. We will work you to make sure that your surroundings are safe. One of the most popular requests from consumers is to help with the yard clean up through the spring and fall. During spring following the snow melted, you’ll see that the lawn appears gloomy. You could call us immediately to deal with this problem because our specialists will get rid of leaves, brush piles, branches and debris from the lawn. Through the fall, it is going to actually be the time to have your yard cleaned up and ready for spring. Woodchuck Tree Service can ensure that the leaves can be cleaned and the debris will be removed. Our guys will search for damaged or harmful limbs. To make sure that your gutters will have proper drainage, make sure that you clean it twice a year. Blockages in the gutters can cause ruin to your siding and also to the other parts of your house. Once the gutters are blocked, it would imply that the water will overflow from the top of the gutter and spill to the side of your house. Woodchuck may offer colored mulch since it could make your landscaping around the house and trees look fantastic and it can hold moisture on your plants. Our mulch is house made and this is made from local trees. We are going to provide pick-up and delivery services based on your preference. If you need lawn care, you may call us now. If there is a service that you’d like or need and we do not offer it, you may ask us. We’re going to check if we will offer your needs because we want to work for you. We will offer free estimates on our services and we provide discounts if you’ll consider multiple services. If you’d like to thin out your trees in the area, we may help you on your issues. Lot clearing will including taking down trees or trimming limbs out of the way and remove the branches to turn them into wood chips. Lot clearing is a hazardous task and it is important to guarantee that the work could be done safely. Woodchuck Tree Service have the best specialists that utilize equipment to take out trees and clear brush. We’re going to help remove the trees and stumps and clear the bush. We will even remove weeds and shrubs. Do you want firewood for sale during a cold day or do you would like to use your stove to keep the house warm? You do not to look elsewhere since Woodchuck Tree Service may help you. We may offer premium mixed hardwood that may contain ash and oak that have been seasoned for over a year. Tough woods are wonderful for fire due to the length of time that they can melt away. Dry wood won’t be smoky so it is perfect for your home. Woodchuck Tree Service can provide the best firewood pieces that you would like. We have the best experts that would choose the wood and they could supply this to you if you would like it stacked. Our family owned business is currently operating in Rockford, Illinois. We proudly serve the greater Rockford area in Northern Illinois, including Machesney park, South Beloit, Roscoe, Rockton, Pecatonica, Byron, Shirland, New Milford, Durand, Cherry Valley, Loves Park, Stillman Valley, Oregon, Roscoe, and Seward. We want to keep our company (and as a result our jobs) local. Our children already went to school in Winnebago County and we are lifelong residents of the area. It is a pleasure to serve our community and our neighbors, and something we plan on doing for many years to come.